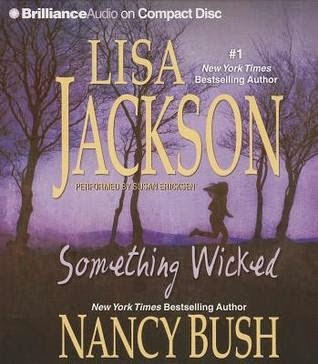 Title/Author: Something Wicked by Lisa Jackson and Nancy Bush. Some refer to it as the Colony. To others, it's a cult. But few locals in the Oregon coastal hamlet of Deception Bay have ever been invited to the inner sanctum of Siren Song. Even the sisters who live here, far from strangers who might recoil at their unnerving psychic abilities, don't know all the terrors buried within its walls? BUT YOU CAN NEVER STOP HIM. Death has come to Siren Song before. But this time there will be no refuge and no remorse. For everything born in wickedness must die that way ? and a killer will not rest until he has claimed them all. ~Goodreads.com. Midnyte Musings: This book caught my eye in the library because of the cool cover and the synopsis promised a cult like community and a supernatural slant. However, neither really lived up to my expectations. The cult like community isn't as creepy as it sounds. It was more like a family with a matriarch who had old fashioned ideas in order to protect her family. The supernatural aspects were interesting, but perhaps it just wasn't executed to my satisfaction. The plot wasn't bad. It just didn't get my blood pumping or intrigue me that much. The characters were fine, but I just didn't connect with anyone and so I wasn't really invested in their lives or problems. There were also events that I didn't understand why they were included. Did Savvy really need to have a baby in a blizzard on the side of the road? The narration was quite, um, dramatic during this part as well. I'm sure some would say a realistic portrayal in an unrealistic circumstance. Then she went back to work the next day...or I'm pretty sure it was the next day. To be honest I can't remember, but it seemed really, really...really soon. Okay, yeah she was the surrogate but still. I liked that the police work was detailed, but I felt it was overworked. If the reader didn't know who the bad guy was fairly quickly, I think this may have worked to build up some mystery. The villain was intriguing if not very multi-faceted and some may find his actions disturbing. There is a lot of talk about "powers" that the people of Siren Song possess and they explained it in an interesting and believable way. I thought this was cool! The book referenced things that made me think it was a sequel or part of a series. When I checked on Goodreads, I found out it is #3. It didn't really subtract from the book, there were just a few details that I didn't have the complete story on. But again, I wasn't invested enough to mind and they didn't really hinder the story. Narration: The narration didn't really work for me. I felt like the speech pattern was very forceful and it didn't sound as natural as it could have. There were a few times, when I really liked blanks portrayal and I kind of wish she had read blank, the main character more that way. Also, a few of the elderly men reminded me of Peter Parker's boss in the Spiderman movies with Tobey MacGuire. I imagined them with cigars in their mouths and it seemed a bit too exaggerrated and cartoonish to me. Starstruck Over: The premise was interesting and the events opened up more questions about the people at Siren Song. Labels: Lisa Jackson, Nancy Bush. I haven't read any Lisa Jackson, but I think I've tried a time or two. Usually, for thrillers, I turn to Tess Gerritsen or Lisa Gardner.